ADDING LIGHT TO YOUR BARN || THE CLASSIC WAY. 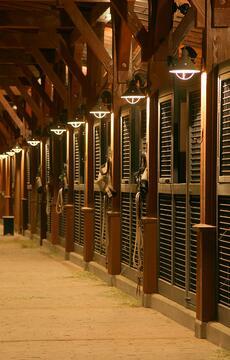 Adding additional lighting to your barn can chase away winter gloom for both you and your horse. Horse's eyes are sensitive to weak light, so they can see fairly well at dusk, but they don't have the ability to adjust their eyes to darkness quickly, which is why they will often refuse to enter a dark building from bright sunshine. In addition, shadows and poorly lit areas make stall cleaning cumbersome and inhibit observation and care. A combination of individual stall and general aisle way lighting is preferred. Place fixtures along the front or side walls to decrease shadows in the stall – this can make your horse wary about entering a dark stall. One fixture above the center creates shadows as the horse comes to the front of the stall for observation. For natural lighting, provide a minimum of 4 square feet of window space in each stall. Glass windows should be either out of reach (generally above 7 feet) or protected by sturdy bars or mesh. Lexan is a good option for window glazing. Position fixtures at least 8-feet high to minimize contact with the horse. Avoid motion sensor lights inside the barn as they are often tripped by barn cat or other animals. Big barn exteriors require big lights - standard residential type lights are typically too small and do not provide enough light. 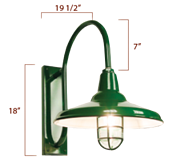 Dusk to Dawn Halogens are often installed over entryways for general lighting purposes and for safety. 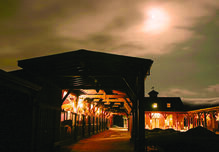 Using lights in strategic places can also help with barn security. Install security lights at farm entrance and around barn doors. Either leave them on from dusk to dawn or install motion detection lights to alert you to intruders. Remember, however, that motion sensors can also be tripped by your barn cat or other animals. In order for the lights (and other equipment) to work in the barn, you need electricity. Some communities will allow you to install wiring with a wiring permit or to install new circuits, but both will require a safety inspection by a license electrician before they can be operational. All electrical wiring in the barn should be housed in metal or hard plastic conduit since rodents may chew unprotected wires, creating a fire hazard. Metal conduit can be used, but has the tendency to rust. Plan enough circuits, outlets and fixtures so switches are within easy reach. Locate switches so lights can be turned on and off at two convenience locations, usually at either end of the barn. Install outlets every 15 feet or so on both sides of the aisle. Light switches should be four feet up from the floor and outlets should be 13-15 inches off the floor (or as required by code).